A riveting classic of European literature, this superb collection of fiction and reportage is set in Italy's most vibrant and turbulent metropolis-Naples-in the immediate aftermath of World War II. These writings helped inspire Elena Ferrante's bestselling novels, and she has expressed deep admiration for the author of this volume. Goyaesque in its depiction of the widespread suffering and brutal desperation that plagued the city, it comprises a mix of masterful storytelling and piercing journalism. This book, with its unforgettable portrait of Naples high and low, is also a stunning literary companion to the great neorealist films of the era by directors such as Vittorio de Sica and Roberto Rossellini. 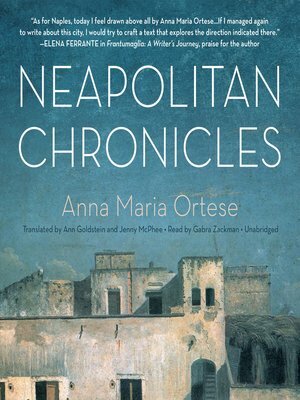 Neapolitan Chronicles is exquisitely rendered in English by Ann Goldstein and Jenny McPhee, two of the leading translators working from Italian today. Included in the collection is "A Pair of Eyeglasses," one of the most widely praised Italian short stories of the last century. Ann Goldstein is the former senior curator at the Museum of Contemporary Art, Los Angeles.